The style of painting, sculpture and decorative arts identified with the Renaissance reached its zenith in the late 15th and early 16th centuries, in the work of Italian masters such as Leonardo da Vinci, Michelangelo and Raphael. 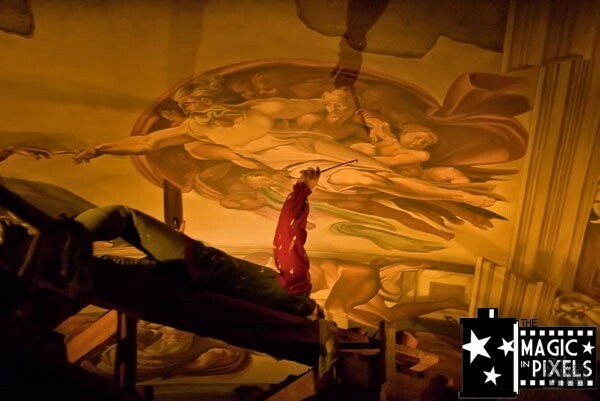 The Sistine Chapel ceiling’s most famous panel, entitled “The Creation of Adam.” is painted before our eyes by Michelangelo Buonarroti as we are surrounded by the sounds of Hallelujahs. Still photos of this scene do not do it justice as there are some subtle movements that make the act of painting look pretty realistic. 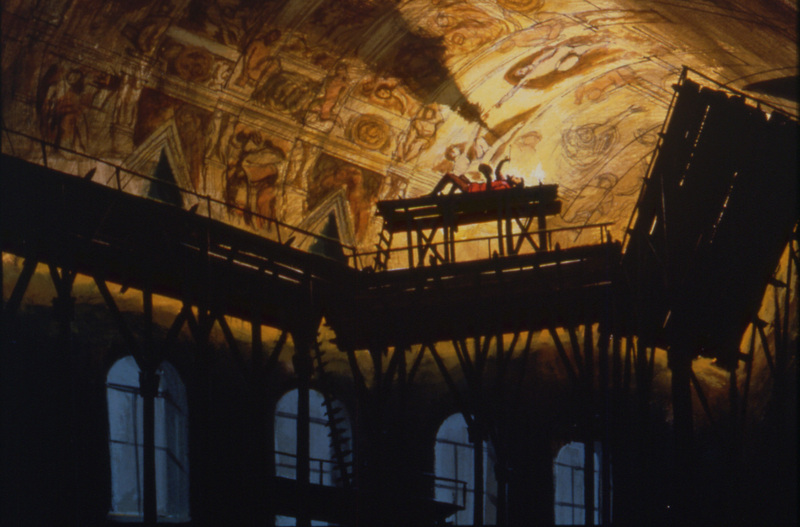 In reality, the size of the entire Sistine ceiling is about the size of 2 basketball courts done in fresco. The section being worked on, The Creation of Adam is about 9 ft 2 in x 18 ft 8 in (1). There are a few interesting points of controversy that have been raised from this scene. In previous ride versions, Michelangelo is presented as painting with this left hand. There are numerous sources claiming that Michelangelo was left handed and there are others that dispute this by studying his art. Its possible that like my older left handed relatives he had to train to use his right hand as dominant. 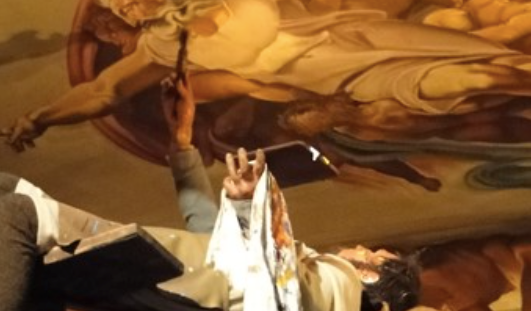 Either way, the latest depiction of the scene shows Michelangelo painting with his right hand but also holding a palette with the left. Laying Down or Standing Up? 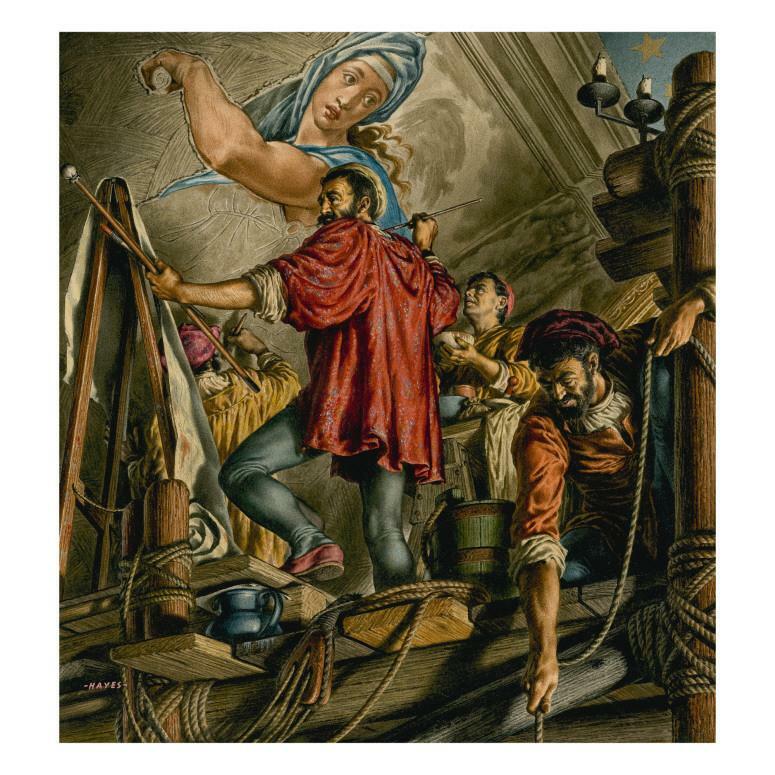 Michelangelo and his assistants used wooden scaffolds that allowed them to stand upright and reach above their heads. Michelangelo himself designed the unique system of platforms, which were attached to the walls with brackets. 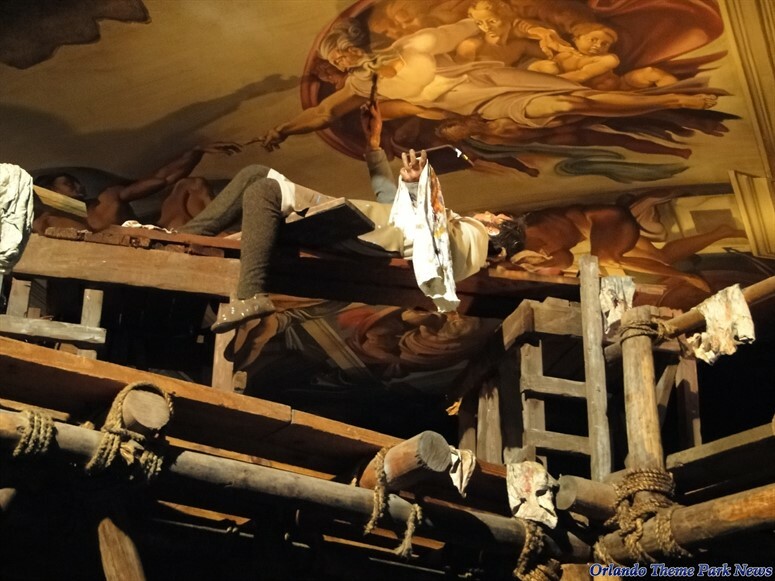 The impression that Michelangelo painted on his back might come from the 1965 film “The Agony and the Ecstasy,” in which Charlton Heston portrayed the genius behind the Sistine Chapel’s ceiling (2). 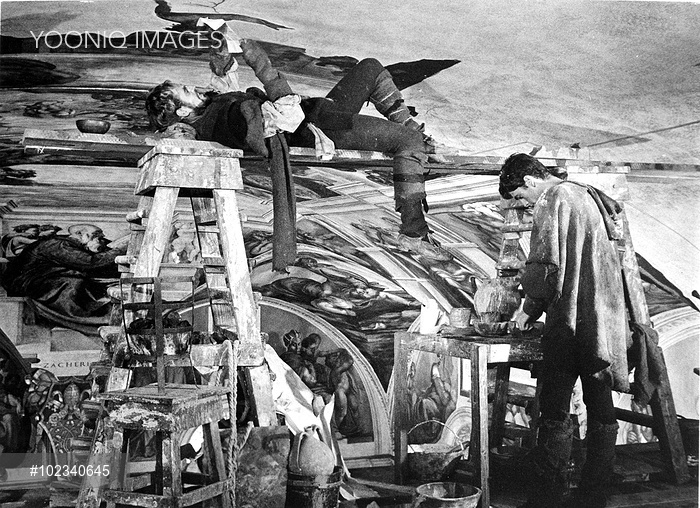 Of course the concept art for the ride by illustrator Claudio Mazzoli also shows Michelangelo laying down (3). 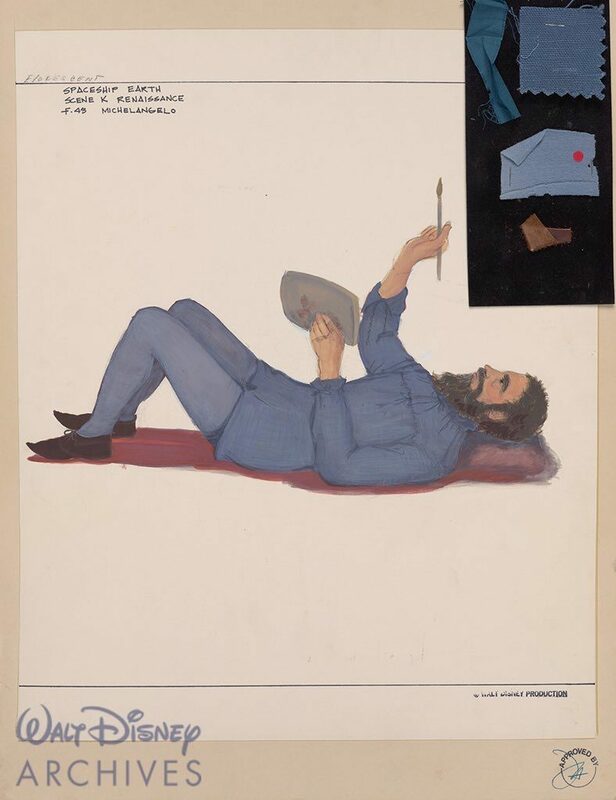 Below is a more likely depiction of how the painting took place. And here, is the ride’s method of completion by a Disney Imagineer!